The seller of this used 48' Sunseeker Portofino is motivated to sell! : Atlantic Yacht & Ship, Inc. The seller of this used 48′ Sunseeker Portofino is motivated to sell! Word from Chris Carroll reports that he has listed a great deal on an used 48′ Sunseeker Portofino! Overall, this used 48′ Sunseeker Portofino has an excellent layout and comfortable accommodations. Coupled with being built on a Deep-V hull this yacht has a moderate beam and pod drives. This is all in addition to the quality that one can expect from Sunseeker yacht. Hand-laid GRP (glass reinforced plastic, also known as fiberglass) makes the hull strong and high-performance. In fact, this used 48′ Sunseeker Portofino is powered by twin Volvo IPS 900 diesel engines which let her cruise at 26 knots! As can be seen by the fit and finish on the used 48′ Sunseeker Portofino, Sunseeker is familiar with building quality yachts. This interior is beautifully appointed in addition to the mechanical features. You will love cruising at fast speeds while sitting comfortably. The tropical specification air conditioning will keep you cool anywhere. Underwater lights are another snazzy feature that will turn heads. The full beam master stateroom is situated aft with guest accommodations forward. 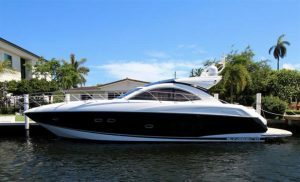 For more information on this used 48′ Sunseeker Portofino be sure to contact Chris Carroll today! Do not miss this beautiful 48′ Sunseeker Portofino yacht for sale in Florida! MAJOR PRICE REDUCTION on this beautiful used 48′ Sunseeker yacht! Look at this beautiful Sunseeker 48 Portofino yacht for sale!